The need for quiet and privacy in the workplace has architects, designers, and employers scrambling to strike the right balance. To create environments that maximize employee engagement, innovation, and productivity, designers need to grasp why and how people work. The era of modern office architecture didn’t begin until the late 19th and early 20th centuries as the Industrial Revolution summoned workers out of their farms and into factories and offices. Of the many inventions during that period, Elisha Otis’s 1853 elevator made taller buildings acceptable work places. Until that point, architects helped their clients maximize their space utilization in huge rooms prone to heat, noise, and poor lighting. It wasn’t until 1937 when the U.S. Fair Labor Standards Act (FLSA) compelled overtime pay beyond the 40-hour workweek that work conditions started to change for the better. As the laws changed, workers’ expectations of their work environment changed along with them. There are several other notable markers in timeline of building that contribute specifically to modern office design and its relevance to privacy. The first is the Bürolandschaft office movement of the 1960s, which incorporated curved screens, potted plants, and organic geometry to promote collaboration within the “pods” of people working on similar projects. The 1980s ushered in an era of “hot desking” or “office hoteling,” which assigns desks ad hoc, based on who’s there at any given time. Workers have neither their own desk, nor a personal space to hang a family photo. The 1990s introduced the cubicle as the premier “one-size-fits-all” solution to workers’ needs for security. Harmony among privacy, collaboration, optimal space utilization, and worker productivity (and engagement) has not yet been found. Since the complexity of the work being performed has increased in recent decades, meeting time has doubled: workers report spending too much time in consultations, in conference rooms, or on virtual calls with distributed teams. The requirements of work interactions have restricted the time needed to concentrate and think about the complex problems presented by today’s volatile marketplace. 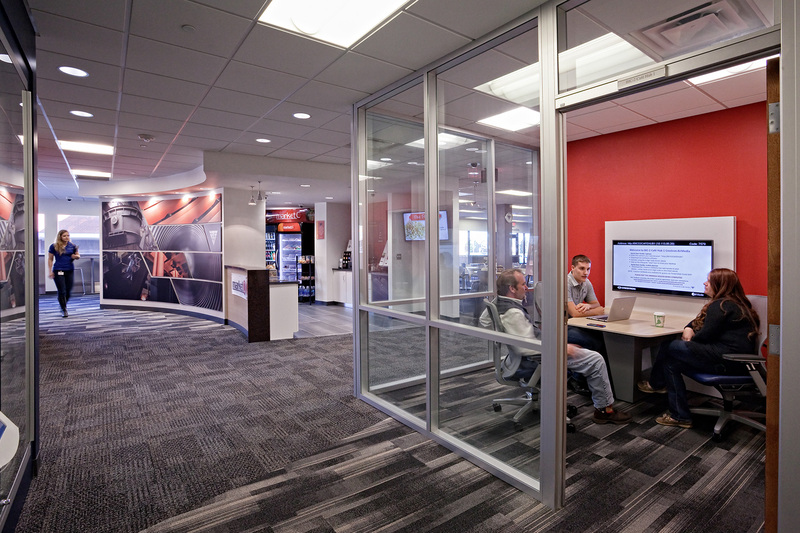 Open collaborative office designs are contributing to that problem. Yet three out of every four CEOs in a 2012 survey of 1700 CEOs, IBM identified collaboration as the most important trait that they were seeking in their employees. It is not surprising to find that management favors collaboration and the type of workspaces that offer visual access to team members. The problem seems to arise from the way the workplace is constructed to drive creative, problem-solving thinking and, as a result, innovation. Collaborative environments continue to be delivered across all BHDP industry designs and customers, including this new workplace for Unum. Image courtesy of BHDP. Creativity requires a balance between privacy and collaboration in order to foster innovation. Design firms, therefore, wrestle with how best to optimize their clients’ effectiveness by making sure privacy and collaboration are in balance. To accomplish this goal requires an investigation of how workers generally define privacy and how much privacy they need. Business and architectural workspace designs are inextricably linked because businesses are comprised of people. How do people negotiate their places of work to produce results? Why do people no longer benefit from their workstations, offices, and conference rooms? What do they need to be productive? Is privacy important to them and in what way? Synonyms and antonyms for “privacy” provide a reference point from which to discuss office privacy, if only as defined by its opposite. Table courtesy of the author. The same person who complains of too much distraction at an open office layout workplace may find refuge at a noisy, high-bar bench seat at Starbucks with their monitor open to prying eyes. In this example, the worker has gained control over the interruptions, not the ambient noise or presence of people, giving insight to his definition of privacy. The challenge in today’s workplace is to be sensitive to individuals’ needs, knowing that some people work better in collaboration than in privacy, while others need the opposite. Designing for the range of needs is important; designers serve their clients best by delving deeply into their clients’ social dynamics — and definitions of privacy — to balance the full spectrum of expressed needs. Choice has become the stronger design strategy for people working between the behaviors of collaboration and the behaviors of privacy, such as this multi-function work environment for Timken Steel. Image courtesy of of BDHP. At first blush, the answer appears easy: construct a working arrangement that has an adequate square footage of both private and public spaces, with frictionless access to whichever is needed for the function and the role in question. But hardscape design (walls, doors, windows, noise, colors, ceilings, and lighting) is not the only answer to people’s craving for privacy; personal preferences and company culture are of equal importance. Each must be factored into the design plans. How much privacy does a person in a particular role need to accomplish their job? Is this driven by their temperament or their specific function? Does their privacy need require a closed door or merely freedom from interruption? Does the resulting workspace create privacy risks, as in the case of working on proprietary information in a public venue? What is the appropriate balance of time spent in collaboration vs. solitude? Is there a resulting ratio of the type of square footage to allocate? How do the company’s mission, vision and culture inform that mix? What materials will best accomplish those objectives? How can science and art, architecture, management, physical attributes (plumbing, heating, ventilation, etc. ), enhance collaboration and privacy? What can social sciences such as psychology, physiology, and anthropology contribute to the design? Diagram courtesy of the author. Privacy and collaboration need to coexist in a balanced environment that allows all temperaments to thrive. The most significant part of the “build” is in the preparation stages, where possible design elements are explored for suitability, but also with sensitivities to budgets and problem solving. Designers who create interior spaces realize that while open space layouts promote collaboration, too much collaboration may lose the best human resources for a lack of privacy or “time to think.” The solution involves the “soft-scape” behavioral sciences as well as hardscape design. Sorting out the behaviors that promote productivity, and designing for them, might just restore equilibrium. Designing environments that affect the key behaviors necessary to achieve strategic results can be done with effective communication and analysis of organizations’ needs, their employees’ roles, and an honest appraisal of the current and future work in what is currently called “the workplace”. Human behavior impacts the bottom line of every business and it always will; designing spaces that honor the variety of privacy needs is a workplace win for the long run. What do “Creative People” do? A recent book has gotten some main-stream attention in a business context connected to the current cries for innovation. After a 2014 Huffington Post article, the author teamed with an academic and cowrote, Wired to Create. While an interesting and easy read containing ideas intent on identifying creative people based on behavioral traits, the book requires a deeper review of creative behaviors to attain truth toward innovative people at work. As with all books pertaining to advice on living, there is a solid level of “fortune cookie” thinking contained within Wired to Create. The ideas contained in the presented truths of how to identify creative people are attached to ‘science’, validating the validity of the presentation. Yet, as with all good fortune cookies, there must be a kernel of validity to imagine the possibility of the fortune becoming real. Be careful of the science being promoted. When reading through the list of behavioral characteristic from the original article, consider if you exhibit the personality trait in your life. How did you decide if the characteristic was true to you? Did you decide with a “Yes” or a “No”? Did you allow yourself the possible answer of “It Depends”? I suspect we all exhibit each of these characteristics within our living, work, learning, family and cultural patterns. Is it true that we are all creatives? What problems are we solving? What dreams are we imagining? What ideas are we creating? Do you or do I measure up to Picasso in terms of creativity? Was Picasso always non-linear in his life and the way he lived it? Not likely, as he certainly had to eat, relieve himself, relate to others, and most famously, he intended to achieve his personal goal of becoming the highest paid living artist in history. Such a goal required the antithesis of several of the traits listed above. And he achieved his goal. All good fortunes focus on the gray zones of possible futures. I received a fortune once that stated: “Your high-minded principles spell success.” I thought for a moment about being “high-minded”, both in terms of being smart, and being aloof. And my principles, well certainly I stand by my principles, whatever those are? And even though I have been a lifelong suffer in poor spelling, I do want to achieve success! In the end, I wadded up the strip of paper and tossed it into the garbage. Possibly, you may be equally critical of the list above about the suggested behavioral characteristic of a creative person. I would choose to suggest that I am a creative person. I know with much practice where my greatest frustrations and excitements for work, life and loves come from. I resist order and familiarity, while seeking out those tensions that excite me personally – like this book and article. I am certain you reach for things that interest you as well, as I know with great certainty you too are a creative person. You took the couple of minutes needed to read this attempt at a semi-diatribe, hoping for an idea to experience. The idea I share is to discern the truth yourself without the need for a constraint such as being creative. Appreciate the noise of our idea-laden world full of fortune cookie guidance, but discern your own value of self, away from judgmental comparison. I choose to crunch the cookie and discard the piece of paper holding this list of 18 traits with a smile.